What is a chart? To begin with, a chart is not a map, although I have indeed seen it defined as a map used for navigational purposes. You’ll remember that a map can be a graphic or symbolic representation of a portion of the earth’s surface. There is nothing symbolic about a chart. It is a precise navigational tool. Specifically, a chart is a graphic representation of a portion of the earth’s spherical surface onto a plane surface according to a specific method of projection with emphasis on things of interest to the navigator. In one sentence, that’s four things typical of a chart that are not found on a map. Also, a full chart is a working surface, and not just meant to be viewed. Most navigational problems, and all plots for heading, track, bearings, set and drift, and everything else, are worked out right on the chart’s surface. 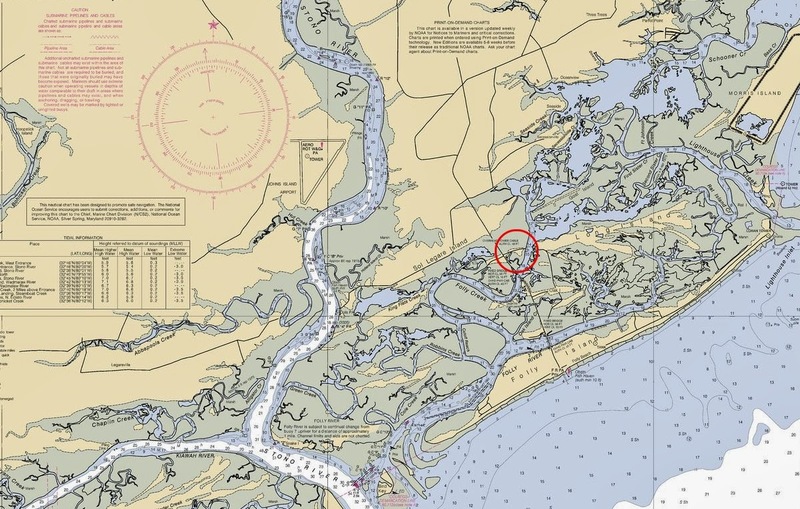 For a paddler, a nautical chart really comes into its own when planning a coastal sea kayaking trip, a navigable river trip, or one through the Great Lakes..
To condense this subject into a small capsule, there are two subjects that can be touched on briefly. The first is of little importance to the paddler beyond academic curiosity, but the second subject is of importance to paddlers who use charts. First, how do we crush a sphere onto a plane, flat surface without distorting it? As we said, distortion is not a big deal on a map, and indeed some distortions are intentionally introduced. On a chart, the distortion must be removed, or concentrated in an area of least importance or, used on charts of large enough scale that distortion is negligible over the area of that chart. There are different projection methods used to accomplish this, each with an advantage to a specific application. Just to name them, they are Mercator, Gnomonic, Polyconic, and Lambert Conformal. The one 99% of us use 99% of the time will be the Mercator chart. Its advantages are that course and bearing lines can be drawn as straight lines, and for plotting ease, parallels and meridians are straight lines and intersect at right angles. Second, the big difference is that the chart stresses those things of importance to the navigator. It incorporates not just a “this way is North” arrow, but a compass rose that gives degrees referenced to the north pole, True North, and may incorporate a concentric inner rose with degrees referenced to Magnetic North, and the magnetic north pole, thus allowing for magnetic variation, or the geographic error between true and magnetic north. In the center of the rose will be the local geographic variation and its rate of change. Since all meridians and parallels are oriented to True North, to use a plotter and get a heading for your magnetic compass, variation needs to be applied, either added or subtracted. There are both nautical charts and aeronautical charts. We’re obviously only concerned with nautical charts. The first thing to do when you pick up a chart is to inspect its legend. It can be spotted by the NOAA crest and label in bold caps. For example: United States - East Coast - Virginia - Chesapeake Bay Entrance. There you will find all the reference information for that chart, such as Mercator projection, Scale, Soundings in Feet from a Datum of Mean Lower Low Water. In the corners of the chart will be the chart number, and the date of its last update and edition number.